How can Scotland and Northern Ireland remain in the EU without seceding from the UK? 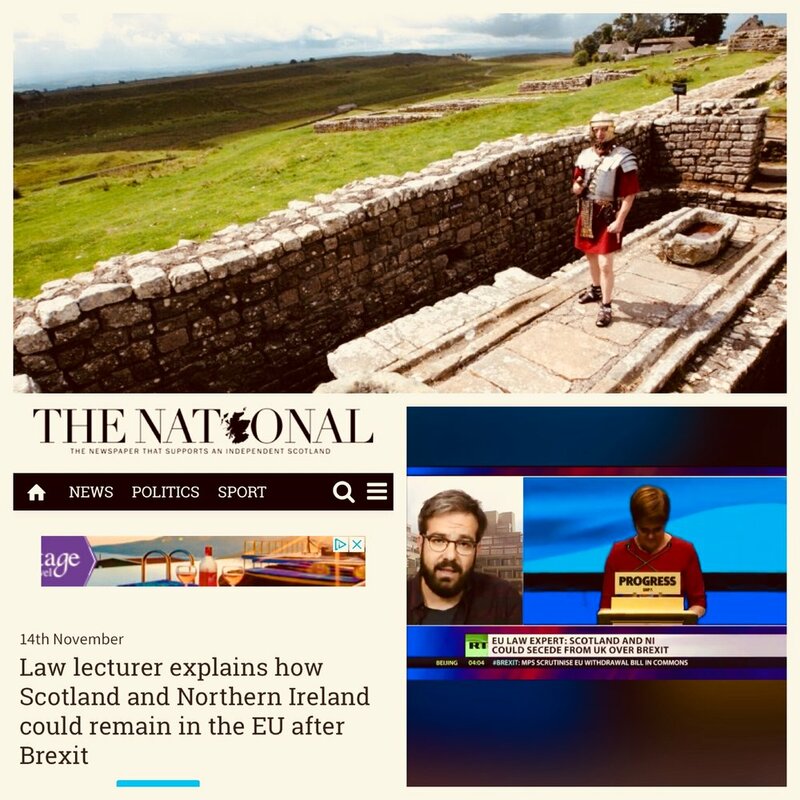 A week ago, my paper with the title 'Territorial Territorial Differentiation in EU Law: Can Scotland and Northern Ireland Remain in the EU and/or the Single Market?' was published in the Cambridge Yearbook of European Legal Studies. As its title suggests, the paper discusses how Scotland and Northern Ireland can remain in the EU and/or the single market even after Brexit. It explores two pathways. The first entails the achievement of Scottish independence and the reunification of Ireland through democratic referendums. The second pathway explores how it would be possible for Scotland and Northern Ireland to remain in the EU and/or the single market even without seceding from the UK. The paper raised considerable interest in the media (e.g. The National; The Irish News). RT interviewed me on Wednesday while Spiegel Online presented my research outputs in an article in its front page. For the non-German speakers (including myself) I have copied and pasted the whole text of my interview that provides for a very good insight to the main findings of my research. Enjoy! Q: Dr. Skoutaris, your paper proposes some pretty daring possibilities as solutions to some of the most complicated Brexit-questions. How was it received? A: My paper aims at showing that the EU has the necessary legal toolbox to accommodate the different aspirations of the UK constituent nations. As such, it has been widely discussed by academics (it was one of the most downloaded articles in ssrn last summer) and in the media (e.g. BBC; The Scotsman; The National; The Irish News) while more and more people have visited my website since. More importantly, my research has not escaped the attention of a number of policy-makers. Last January, I presented my work in front of the European Parliament. This research was the reason that the GUE/NGL Parliamentary group of the European Parliament has entrusted me with writing a Report on how Northern Ireland can achieve an EU special designated status after Brexit. Q: Are we going to see a phase in the Brexit-process when such possibilities will become openly discussed on a political level or even negotiated options? A: In a way, we already see that. Both the UK and the EU have committed themselves to delivering a flexible and imaginative approach to deal with the vital issue of Northern Ireland. Despite the current stalemate, both M Barnier and D Davis reaffirmed this commitment last week. This paper is doing precisely that. It shows that the EU legal order is flexible enough to offer the necessary imaginative solutions. Q: The most interesting possibility seems to be the second in your paper: a kind of soft split via a federation instead of full secession. But would that mean that Scotland and Northern Ireland really could remain within the EU, or would they have to reapply? A: Indeed, this a more interesting possibility especially with regard to Northern Ireland where the aim should be the protection of the fragile peace process. The paper argues that it is possible for both those regions to remain in the EU single market (and the customs union) without seceding from the UK. In order to do that, there are two ways. Both of them require the consent of the UK. The first would entail the amendment of the EU Treaties to the extent that Union law would not apply to England and Wales any more but would fully apply to the other two constituent nations. This is called the 'reverse Greenland’ scenario. However, the UK has triggered Article 50. So the aforementioned scenario seems (at the moment at least) unrealistic. Alternatively, the UK could sponsor the membership of those two regions in EEA. In order to achieve that, the EFTA Convention and the EEA Agreement should be amended in order to allow the membership of sub-state entities. This might seem unrealistic but -as we speak- the Faroe Islands (together with their metropolitan State, Denmark) are exploring the possibility of joining EFTA. So, it is legally possible and politically viable for those two regions to remain in the single market via a UK-sponsored membership. Q: Who would benefit from such a solution? A: Both the UK as a whole and its constituent nations. For the UK government, the biggest incentive to accept and sponsor such a solution would be that it represents a tangible alternative to secession. The United Kingdom might become almost a confederation but it will still be one recognised State under international law. In other words, it could save the Union. Given the debates on a second independence referendum in Scotland and the debate on an Irish unity referendum, this benefit should not be underestimated. On the other hand, Northern Ireland and Scotland could also avoid the tensions and divisions within their own communities that could be caused because of their secession. In particular, such a solution presents less threats to the fragile Belfast Agreement than Brexit itself or a referendum for the unification of Ireland. Even if neither the UK nor its constituent nations opt for such an arrangement, it could still prove useful. It could be used transitionally until the constitutional status of those two constituent nations is definitely decided, ensuring that they do not find themselves outside the single market even for a minute. Q: Is there any incentive for England and Wales in it? How could they profit from such a solution? A: The first incentive is the preservation of the UK unity which at the moment should not be taken for granted. The second is that this solution allows all the UK constituent nations to achieve the European future they voted for. Q: How complicated would it be to transfer the UK into a confederation? And would governments of federated states differ from devolved governments at all? A: From a legal/technical point of view such change will not be very complicated. This has to do with the flexible nature of the idiosyncratic UK constitution which is very different from the German constitutional order. The UK Parliament would have to amend the devolution acts with simple majority after it has obtained the consent of the Scottish and Northern Irish parliaments. However, the governments of the UK constituent nations would be very different in the sense that they would acquire new extensive powers. The Scottish Government has already argued that Scotland should acquire competences in a number of areas, such as international relations like the Belgian sub-state entities and immigration like Quebec. Q: What would such a solution mean for the citizens? Would they feel it in their daily life? A: One of the commitments that the UK government has set in the current negotiations is to protect and preserve the Common Travel Area even after Brexit. According to this arrangement, that predates the UK membership to the EU, the citizens of the UK and Ireland can enjoy free movement within those two islands. The solutions that the paper describes do not in any way hinder this goal. So the people of those islands will not feel any difference when they move around. The situation with regard to the free movement of goods, however, is different. Unless all UK constituent nations are within the UK customs union, there will be internal customs borders. However, we have to be honest here. There are no magical solutions. Theresa May has confirmed that UK’s intention is to be out of the EU customs union. This means that unless Northern Ireland remains in the EU customs union there will be a territorial customs border on the island of Ireland. In a way, because of Brexit, Northern Ireland, has found itself in the unenviable position having to choose between a territorial customs border with the Republic or a maritime one with the rest of the UK. Q: How about the EU? You quote Greenland, the Faroe Islands and Cyprus as examples for the flexible handling of regions/territories only partly belonging to the EU. How far is that comparable to the possibilities you proposed? A: There are important differences. First, Greenland, the Faroe Islands and northern Cyprus represent territorial exceptions because of certain historical and political circumstances that do not bear any resemblance to the political situation in the UK. In addition, in all the cases, the metropolitan State fully participates in the political and constitutional life of the EU, something that would not apply to the case of the UK in the future. More importantly, in all those cases the relevant regions have opted out from areas of EU law while Scotland and Northern Ireland would opt in the Union legal order in case they want to remain in both the UK and the EU. At the same time, unlike what happens with Scotland and England, Greenland, Faroe Islands and Denmark do not share a territorial border. On the other hand, the reason I refer to Cyprus is that it is the only Member State where the acquis does not apply to a significant part of its territory and there is a territorial border between the part where it applies and where it does not. Notwithstanding the significant differences, however, it is important to revisit all those cases in order to understand the legal mechanisms that allow for this kind of exceptions. In a sense, all those examples provide inspiration for the legal arrangements that have to be found in order Scotland and Northern Ireland to remain in the EU and/or the single market without seceding from the UK. Q: Accepting the legal possibility of the discussed options: How about their practicability? Would they be fit for daily life? Would they be good solutions benefitting the people? A: The paper does not suggest that those are ideal/perfect solutions. In fact, it admits that there are important practical problems that have to be settled. The underpinning thesis of the paper, however, is that Brexit will create important tensions in the constitutional and political life of the UK and in particular in the peace process of Northern Ireland. The options that I discuss aim at absorbing those tensions. To the extent that they can provide for viable alternatives to traumatising political developments like a secession can be, the lives of people can greatly benefit from them. Let us not forget that the raison d’etre of the EU is to preserve the peace in Europe by offering a pragmatic framework where competing nationalisms could be co-existing peacefully. The solutions that my research lays out might not be the easiest to adopt but they do offer pragmatic answers to a real political and constitutional conundrum.